All of the Hawaiian shapers that build large wave guns have been extra busy this year, especially with 10’6- 11’6 guns. It seems everyone is adding a wider thicker big wave gun to their board quivers. Eric Arakawa and I had designed and built 2 blank plugs with US Blanks the summer before last, and we have been using these 10’8 and 11’8 blanks for the 4″+ thicknesses surfers are asking for, and 22″+ widths. The “Jaws” version has less nose rocker and more thickness forward. Otherwise, these guns are for outer reef situations. Since this present Winter season has been the best for consistent large surf in some time, we’re all building different versions of the same thing, and the above blanks have been very limited in availability due to the higher than normal demand. 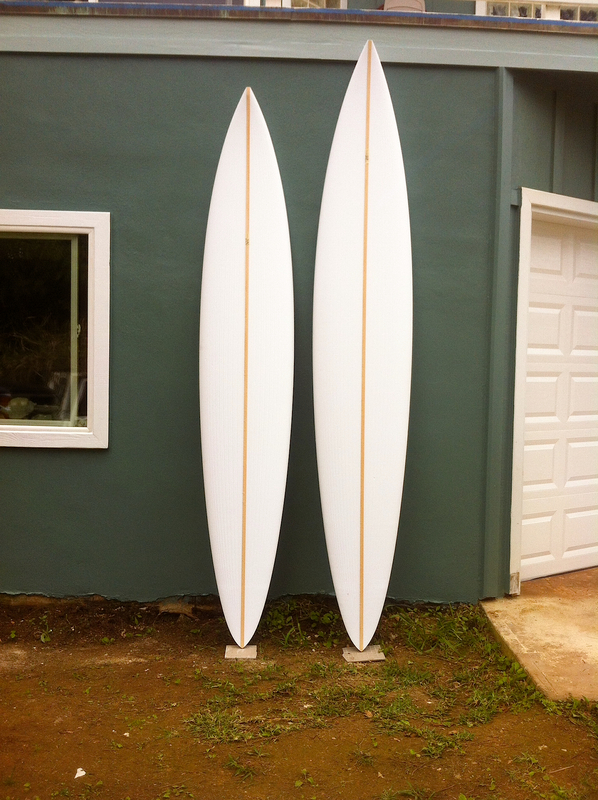 On the right is an 11’6″ x 23″ x 4 3/8″ quad gun shaped blank for Mike Coleman, for extra large Makaha Point surf. On the left is an 10’6″ x 22″ x 4″ quad gun shaped blank for my brother in law, Cole Doeh for North Shore cloud break spots unknown.